Laura Fleckney, future Camp Spring Creek counselor. Laura grew up around cars and racing, so we're pretty sure she'll love North Carolina! This stylish young woman is Laura Fleckney, who will be joining us this summer as a counselor! Laura hails from Bedfordshire, England, where she works at a preschool and as a nanny for two young boys. This won't be Laura's first time in the US: she once worked as a nanny in Northern Virginia. 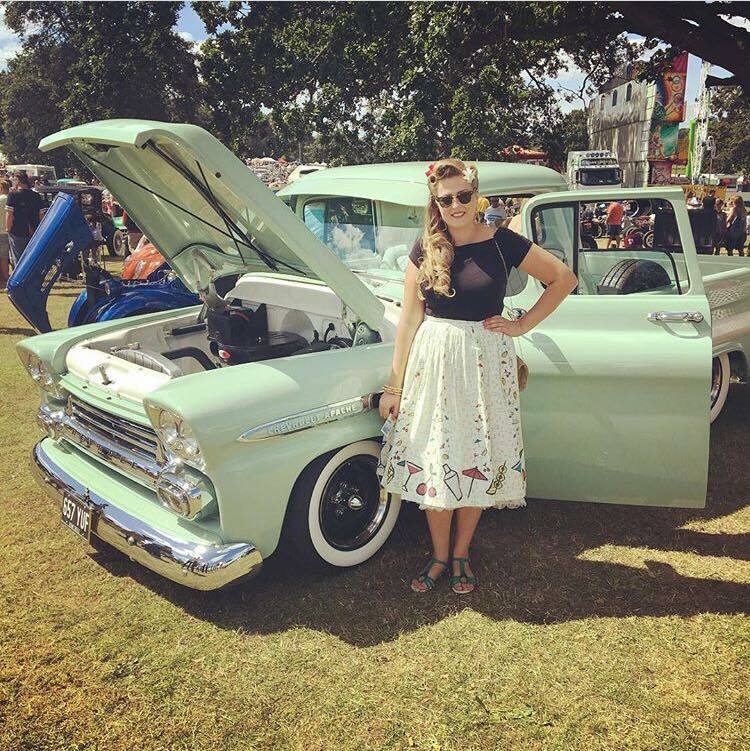 Laura is a fan of anything vintage: vintage cars, vintage clothes and the music of Elvis Presley. Laura loves crafting and is excited to get to the North Art barn to help our campers with fun projects this summer. We asked Laura to share a little more about herself here. You’ve got a lot of experience with children. What’s your secret to keeping kids happy and engaged? Supporting children’s interests is huge and I feel it’s really important to help children extend their ideas and knowledge in ways they find exciting and engaging. I enjoy walking, there’s lots of countryside around where I live and I love Sunday strolls and bike rides along the canal in the summer. I also like camping, me and my family go away drag racing at weekends with my dad. I Love to go on Day trips to the seaside-rain or shine! I asked my friends and one responded: “I would describe you as the most caring and friendly of people, basically the best friend I have ever had. someone that I can always rely on and is always there for others, artistic and creative especially in the way you dress and see the world through your 1950's eyes. You have an everlasting love for Elvis that goes beyond anything, you’re passionate, fun, bubbly and you’re a people person. You connect and communicate extremely well with others and support and encourage others” This brought a tear to my eye... I’m very lucky to have such an amazing supportive close group of friends. Anything chocolate, I am a total chocoholic! Our American friends love English chocolate. I’ll bring some with me to camp!! Is there a game or craft that you’d like to teach campers this summer? Yes! I would love to get the campers doing some sewing and making their own things to use around camp, e.g. pool bags. Steve is going to get two sewing machines for the art barn so this will be very exciting! Morning person..... once I’ve had a good English cup of tea! I like Harry Potter but I have to admit I haven’t seen all of the films so it’s got to be Hogwarts! What will campers be surprised to learn about you? Well, I’m sure it won’t be much of a secret but I’m completely in love with Elvis Presley! I go out jiving at the weekends and love to dance! I’m most looking forward to meeting new people and making a difference, and giving the campers the summer of a lifetime. I am sure I will have the summer of a lifetime too! I’m so excited to get on that plane and meet everyone! Laura (second from left) at her sister's wedding! Older PostShould You Send Your Child To A Private School?